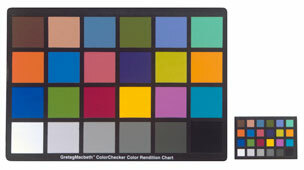 The GretagMacbeth ColorChecker® has been around since 1976 when it was called the Macbeth ColorChecker®. Originally proposed by C. S. McCamy, H. Marcus and J. G. Davidson in 1976 as a test for photography, television and printing, it is still being produced and used for a variety of color tests and color profiling. The ColorChecker® consists of 24 squares of paint applied to paper then mounted to a cardboard backing with a black frame around all the patches. The colors were chosen to represent various natural objects, colors that are problematic for color reproduction, additive and subtractive primaries, and a gray scale. Originally offered in a 13 x 9 inch form only, the ColorChecker® is currently offered in an 11 x 8 inches size and a pocket sized Mini ColorChecker® at 3.25 x 2.25 inches. The Munsell data is from the original McCamy et al publication. CIE 1976 L*a*b* coordinates were obtained by averaging spectral measurements from two October 2002 edition ColorCheckers® The charts were measured with a GretagMacbeth Spectrolino® equipped with a D65 filter. The spectral data was acquired, averaged and analyzed with SpectraShop™. For color profiling purposes, it is imperative that a custom reference file be created for each individual chart. This is especially important for programs that perform spectral profiling because the ColorChecker® colorants have been reformulated several times since its original release and the spectra for many of the patches have changed significantly. It is to GretagMacbeth's (now X-Rite's) credit that they have maintained the appearance of the patches during these reformulations but the profiling packages do not offer reference files for the different ColorChecker® editions. It is up to the user to make a custom reference file by measuring their individual ColorCheckers®. The spectral data for many different editions of the ColorChecker® may be downloaded from the Spectral Library. Using these files with the demo version of SpectraShop™ will allow you to compare the spectra for the different editions and get colorimetric values for a large variety of viewing conditions. C. S. McCamy, H. Marcus, J. G. Davidson, A Color-Rendition Chart, Journal of Applied Photographic Engineering, Volume 2, Number 3, Summer 1976, pages 95-99.